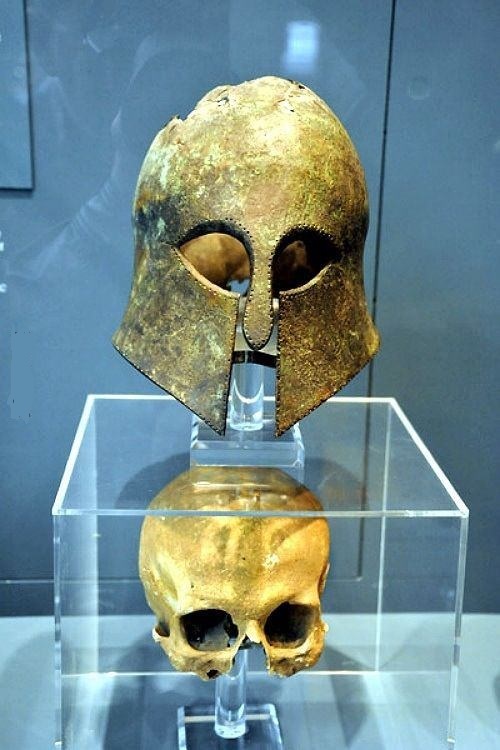 Corinthian helmet from the Battle of Marathon (490 BC) found with the warrior's skull inside. The Corinthian helmet type is one of the most immediately recognisable types of helmet, romantically associated with the great heroes of Ancient Greece, even by the Ancient Greeks themselves who rapidly moved to helmet types with better visibility, but still depicted their heroes in these helmets. In modern portrayals of Ancient Greek warriors, it is always the Corinthian type that is depicted, although often modified to suit the look desired - for instance in one movie the helmet was modified to expose more of the face of the actor. It was a helmet made of bronze which in its later styles covered the entire head and neck, with slits for the eyes and mouth. A large curved projection protected the nape of the neck. 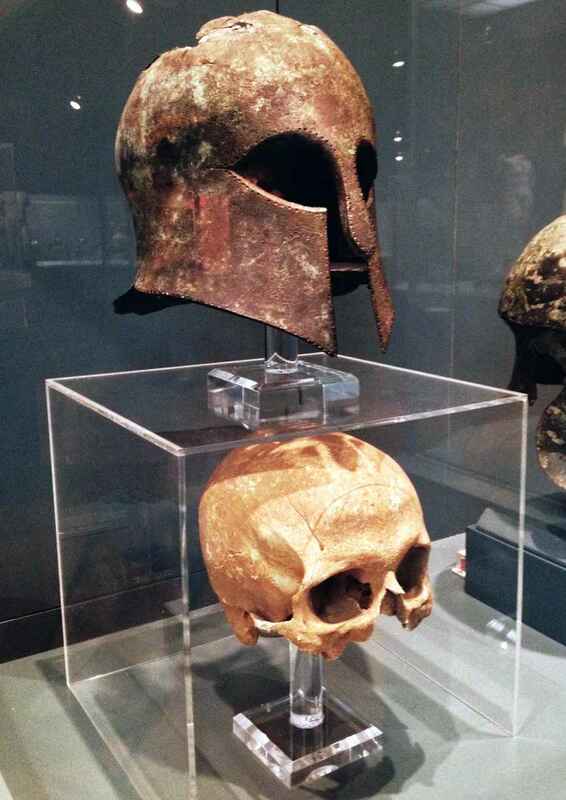 Out of combat, a Greek hoplite would wear the helmet tipped upward for comfort. This practice gave rise to a series of variant forms in Italy, where the slits were almost closed, since the helmet was no longer pulled over the face but worn cap-like. Although the classical Corinthian helmet fell out of use among the Greeks in favour of more open types, the Italo-Corinthian types remained in use until the 1st century AD, being used, among others, by the Roman army. This helmet was excavated by George Nugent-Grenville, 2nd Baron Nugent of Carlanstown, on the Plain of Marathon in 1834, according to letters from Sutton dated to 2 & 20 August 1826. 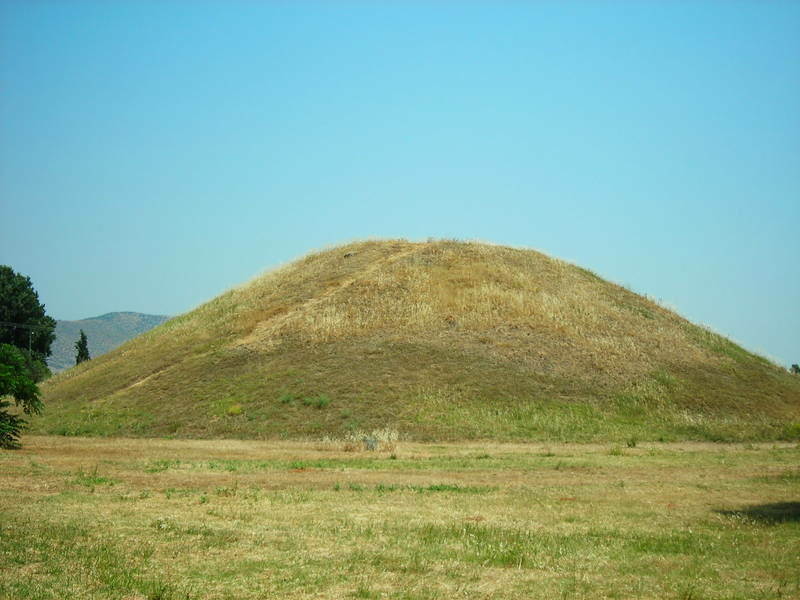 2500 years earlier, on the morning of September 17, 490 BC, some 10,000 Greeks stood assembled on the plain of Marathon, preparing to fight to the last man. Behind them lay everything they held dear: their city, their homes, their families. In front of the outnumbered Greeks stood the assembled forces of the Persian empire, a seemingly invincible army with revenge, pillage and plunder on its mind. The two sides faced each another directly, waiting for the fight to start. The Athenians stalled for days, anticipating reinforcements promised by Sparta. But they knew they could not wait for long. The Persians, expecting as easy a victory as they had won against enemies so many times before, were in no hurry. One final legend of Marathon and one which has carried its name up to the present day is Herodotus’ account of a long-distance messenger (hēmerodromos) named Phidippides. He was sent to enlist the help of the Spartans before the battle and he ran to Sparta, first stopping at Athens, a total distance of 240 km (a feat repeated by an athlete in 1983 CE). Later sources, starting with Plutarch in the 1st century CE, confuse this story with another messenger sent from Marathon after the battle to announce victory and warn of the Persian fleet’s imminent arrival in Athens. In any case, it was from this second legend that a race - covering the same distance as the 42 kilometres between Marathon and Athens - was established in the first revival of the Olympic Games in 1896 CE to commemorate ancient Greek sporting ideals and the original games at Olympia. Fittingly, the first marathon race was won by a Greek, Spiridon Louis.